Sophomore center Seamus Kelly is part of a Cal squad that has held opponents to just 21 points in its past three games. 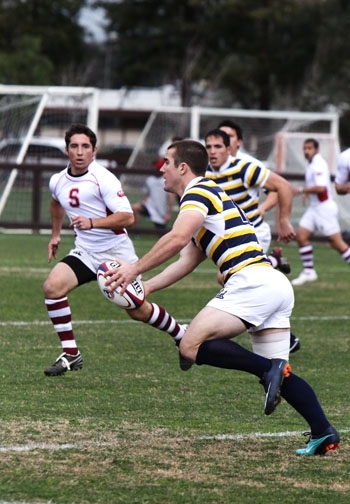 Going into this weekend, the Cal rugby team had outscored its opponents 245-14 in its three league matches. What would happen when the Bears gave their opposition a one or two man advantage? In two matches against UCLA and the Claremont Colleges this weekend, Cal outscored its two divisional foes, 162-7. The lone seven points given up came while the Bears played a man down due to a yellow card for repeated infractions on Sunday afternoon against the Dragons. According to coach Jack Clark, however, the score was not a byproduct of Cal's penalty. "Typically what happens when you play down is you give up points," Clark said. "On the try we gave up, we just missed a tackle ... It wasn't because we were a man down." Prior to the score, the Bears had fended off another Claremont one-man advantage and put up 48 points. Senior outside center Sean Gallinger led the way, bookending halftime with converted tries and notching a hat trick in the 46th minute. Cal (21-0, 5-0 in the CPD) responded to the Dragons' score with two converted tries for a 62-7 final score, denying Claremont its first CPD win. But the Bears faced far worse conditions at UCLA the day before. With a 57-0 halftime lead, Clark opted to use his allowed substitutions early in the second half. In the final frame, however, two Bears - freshman scrumhalf Paul Bosco and inside center Jared Braun - went down with injuries, forcing the Bears to play shorthanded. "I'd rather save some minutes for some of our first choice players and keep them injury-free for next week (at St. Mary's)," Clark said. While the Bruins whiffed the goal line, Cal made strong defensive stands to repel UCLA and preserve the shutout. The 100-0 triumph was the Bears' third triple-digit win this season, and their third shutout in league play. Clark put out a mixed lineup on both days, which produced mixed results. Sunday's lineup featured 14 new starters from the preceding day, and 11 underclassmen logged time on the field compared to Saturday's 10. "We put out a slightly stronger team against UCLA, and that allowed us to play with just a little higher performance level," Clark said. "Credit to Claremont - they were pretty physical. They make tackles around the fringe and I think they battled in the forwards especially pretty hard." Despite a slow start, Sunday was an improvement for at least one Bear. Junior flyhalf Alex Aronson, one of the players battling for more playing time, went 3-for-7 in second-half relief against UCLA, but impressed against the Dragons. On Sunday, the Concord, Calif., native put in 7-of-9 conversion kicks, in addition to a 30-meter penalty kick in the 14th minute for the game's first points. "I was getting a lot more consistent strikes on the ball (on Sunday)," Aronson said. "I think the biggest thing I can prove is that I can communicate well and make good decisions."